Twenty years ago this Sunday a six-day wave of violence, looting, vandalism and arson began that swept through African-American, Latino, and Korean neighborhoods of South-Central Los Angeles. CSUN journalism Professor Taeyun Kim invited four members of the ethnic media who covered the 1992 LA riots to share their experiences during a panel discussion titled “Sounds that Heal” at the Valley Performing Arts Center, Wednesday. 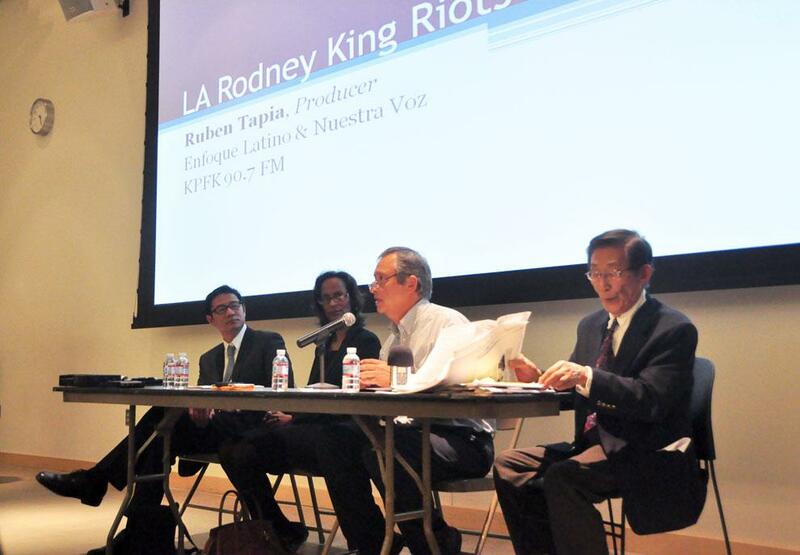 Jin Ho Lee of Radio Korea, Karen Slade of KJLH radio and Ruben Tapia of Radio Bilingue, representing the Korean, African-American, and Latino communities, offered an up-close alternative to the mainstream media’s perspective on the riots. “An influx of calls were coming in….saying ‘my store is burning’. It was just not one or two calls, but calls were coming from all different directions,” said Lee, who was in his second year of reporting for Radio Korea. Lee said listeners were calling in, begging for someone to call the police or fire department, because their calls weren’t getting through. However, authorities were unprepared for, and overwhelmed by the magnitude of the riots. According to Lee, over 2,300 Korean-owned businesses were burned or looted. The riots started on April 19, 1992 after four LAPD officers were acquitted of assault charges for the beating of black motorist Rodney King during a traffic stop. African-American anger over the verdict caused racial tensions to boil over in neighborhoods of South-Central L.A. and Koreatown. Fifty-three people died, thousands were injured, and thousands of buildings were burned or vandalized, with over $1 billion in property damage. “The verdict went the way we didn’t expect it to go,” said Slade, who was working for Stevie Wonder owned KJLH. Like Radio Korea, KJLH suspended its regular programming to focus on the riot crisis. The station broadcast the calls of angry, frustrated and scared listeners in an attempt to vent the anger in the community and lessen the violence. One call Slade will always remember is someone who reported a nursing home that was on fire. Police and fire departments were unresponsive, so Slade broadcast the address of the nursing home, requesting listeners to help. Local residents came out to successfully evacuate the patients from the fire. Tapia lived less than a mile from the corner of Florence and Normandy where the riots began. Tapia got his start as a reporter describing what he saw from the streets. However, Tapia also remembered seeing an African-American man drag a woman who had been pulled out of her car into his house to save her from being beaten by a mob. Also featured on the panel was K.W. Lee of the Korea Times, the first Asian immigrant to work for a mainstream daily newspaper in the United States. Lee tied his perspective on the experience of immigrants in the L.A. riots to his experience covering the civil rights movement in the U.S. in the 1960’s. “The reason I see only hope after the riot is you,” Lee said to the multi-ethnic audience of students in attendance. He remarked on how much more diverse college campuses have become since the 1960’s. The event began with a preview of the short film “Love Thy Neighbor,” by CSUN alumnus Minho Ha. This fictional story, inspired by actual events, chronicles the reunion of an African-American teenager with the Korean store owner for which he worked, 20 years after their friendship was torn apart by the riots.